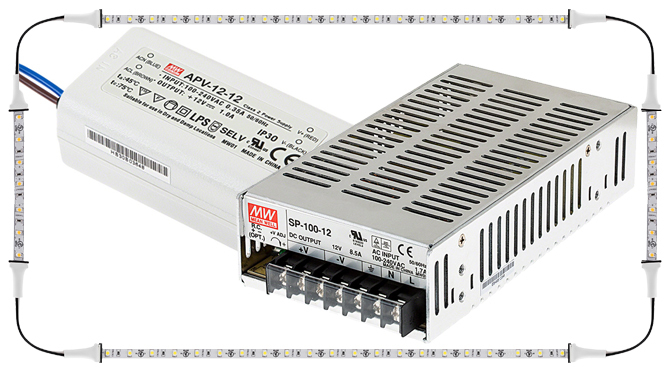 Choosing the right power supply for LED strip lighting can be a bit trickier than you’d expect. Factors such as wattage and dimmability play key roles in the selection process, and oftentimes, there is more than one power supply that will work for your particular project. There’s nothing worse than ordering something online and then realizing you don’t have the parts needed to make it work. This article aims to give you all of the information necessary to feel confident that you have what’s needed to power your LED strip lights before you purchase them. What is the function of an LED power supply? Let’s start with the basics. The function of a power supply is to provide the correct amount of electrical current to electronics so that they work like they are supposed to and don’t overheat or fail prematurely. Whether it’s your cell phone, laptop, or in this case, LED strip lights, you’ll need something to take the 120 volts of alternating current (AC) from your wall outlet and convert it into a lower voltage of direct current (DC) that your LED strips (or other electronics) require to run. Think of trying to fill up a water balloon with a fire hose: too much water flowing too quickly—pop! The power supply regulates the flow of current to your strip to ensure optimal functionality. Strips with more LEDs per foot will consume more power. Larger LEDs will consume more power. In short, if maximum energy efficiency is what’s most important to you, choose a light strip with smaller LEDs and fewer LEDs. Make sure the total wattage of your LED strip lighting is at least 20 percent less than the power supply’s rated wattage. For example, if you have an LED strip light that requires 80 watts of power to run, you’ll need a power supply that’s rated for at least 96 watts. The vast majority of our strips include wattage per foot right on their product pages. Now it’s time to bust out those sixth grade math skills! Take the length of your LED strip in feet and multiply it by the watts consumed per foot, then multiply by 1.2. This will give you the minimum sized power supply you’ll need to run your strips. Because power supplies are available in a variety of wattages, you’ll take the number you came up with and find the closest power supply that has a wattage rating higher than that number. Super Bright LEDs’ power supplies range from six watts to 1,500 watts for compatibility with a wide variety of LED strip lights. You’re looking to install 22 feet of under-cabinet lighting in your kitchen. The strip consumes 3.5 watts per foot. Multiply 22 feet by 3.5 watts per foot. The total is 77 watts—meaning your strip draws 77 watts of power. Then, to follow the 20 percent rule, multiply 77 watts by 1.2. Multiplying by 1.2 gives you your strip’s total wattage plus 20 percent. Remember, this is to prevent your power supply from overheating and failing prematurely. This means that you will need a power supply that is rated for at least 92.4 watts. Because power supply wattages are multiples of five and 10, you’ll need to round up and purchase a 100-watt power supply. It is acceptable to run strips on a power supply rated higher than the amount needed. In fact, if you decide to add more LED strip lighting to your project in the future, having more power will come in handy. 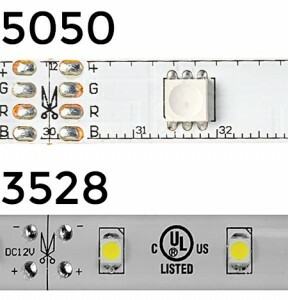 Our LED strips already have current-limiting resistors built into the strip, so they will only draw what they require. The extra wattage of the power supply will not be used, which will allow the power supply to run cooler and more efficiently. If you run your power supply over its capacity, this will cause the power supply to overheat. When any electronic components are overworked, they overheat and can shut off or fail prematurely. We put together this chart as a rough guide to help illustrate which power supply is needed for lengths of strip with different power consumptions (measured in watts per foot). This table includes examples only and is not intended to be used as a buyer’s guide! It’s important to verify that the voltage of the power supply you choose is compatible with the voltage of your LED strip lighting. Also, be sure that the power supply’s input voltage matches that of the location it will be installed in. If you have an LED strip with 12-volt DC operation that you wish to use in a 120-volt AC home wiring system, you’ll need a power supply that includes 120 volts in its input range and has 12-volt DC output. 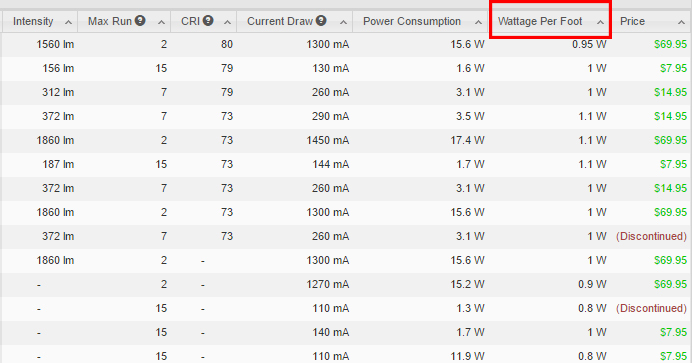 Another factor to take into account for longer runs is voltage drop. A significant voltage drop is present after a certain distance of LED strip. After this distance, there will not be enough voltage present to light the next length of strip. This varies depending on the type of strip and length being used. Usually, a single-density strip (nine or less LEDs per foot) will need to run back to a power source every 32 13/16 feet (10 meters). A high-density strip (18 or more LEDs per foot) will need to run back to a power source every 16 3/8 feet (5 meters). Please refer to “Max Run” in the specifications table of the strip light to determine how many can be run continuously without a parallel run back to power. If your LED strip lighting is dimmable and you wish to adjust its brightness, you’ll need to be sure that the power supply you choose is capable of dimming. All of our power supplies are labeled as to whether or not they’re dimmable. For more on dimmability and types of dimming, check out this post. 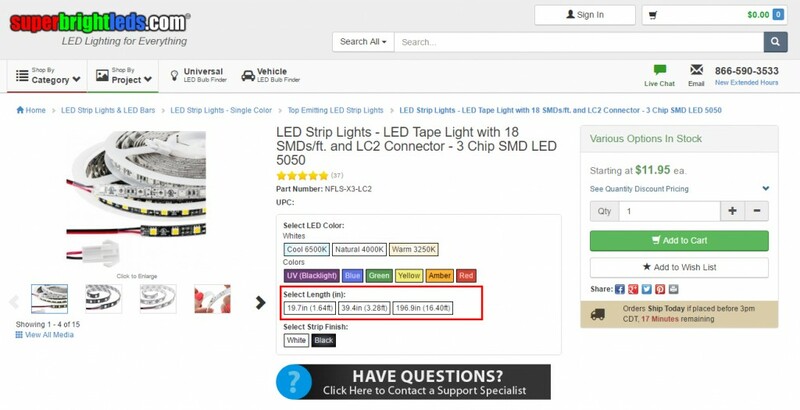 Luckily for you, we have a power supply calculator on the product pages of all of our LED strip lights! Step 1: Select your strip and the length you need. Step 2: Scroll down, and click the blue “Power Supplies” tab. 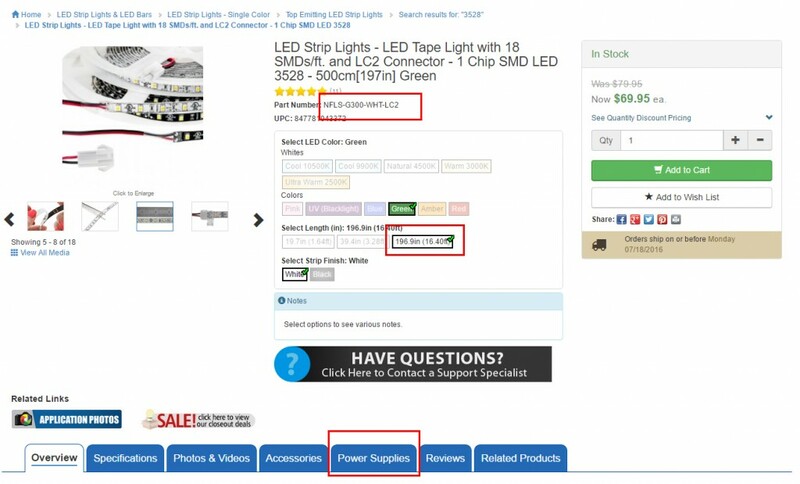 Step 3: Click the green “Power Supply Calculator” tab, and select your product by choosing it from the list OR by pasting the exact part number in the search bar. Step 4: Enter the number of strips at the desired length you’ve selected and voila! You’ll see a list of all compatible power supplies with the best match at the top of the list! When dealing with electronics, safety is paramount, and you want everything to work like it’s supposed to. So if you’re still not sure which power supply to use for your LED strip lighting project, just reach out to our technical support team or customer service department at 866-590-3533. Our teams are available from 8:30 a.m. to 8 p.m. CDT Monday-Thursday and 8:30 a.m. to 4 p.m. CDT on Friday. What Is Needed For Installation of RGB LED Strips and RGB LED Light Bars?